A beautiful 18ct yellow gold ring, claw set with three brilliant cut diamonds totalling 1ct. A timeless classic to cherish forever, perfect as a gift or as a token of your true love when asking that all important question. 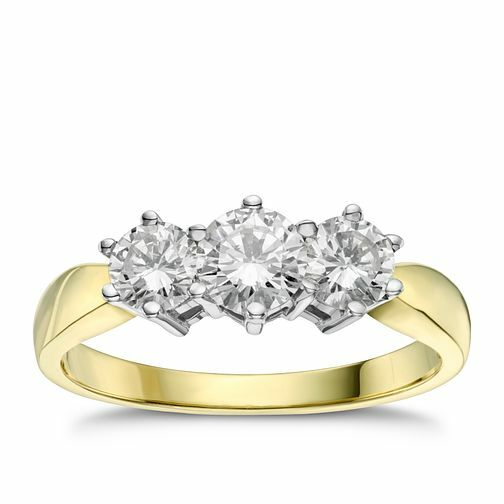 18ct gold 1ct diamond three stone ring is rated 5.0 out of 5 by 16. Rated 5 out of 5 by Anonymous from Diamond ring My girlfriend was over the moon with this beautiful ring. Great value for money and looks fantastic! Rated 5 out of 5 by Anonymous from A very special 30th Wedding Anniversary Present This ring is beautiful and very high quality. The gold band is a nice width and thickness but not too thick to wear with my wedding band and eternity ring, a consideration as I have small hands. The diamonds are very white and extremely sparkly! I would highly recommend this ring for either engagement or a special anniversary.